Designers practice at the convergence of multiple disciplines: technology/engineering, art/aesthetics, manufacturing, business/strategy, and sociology/consumer behavior. How does a designer navigate within so many disparate areas? What attributes separates a design that is held in the highest esteem with one that never achieves significant success or recognition? This paper looks at three key areas: Designer-Creator, Designer-Strategist, and Designer-Visionary. 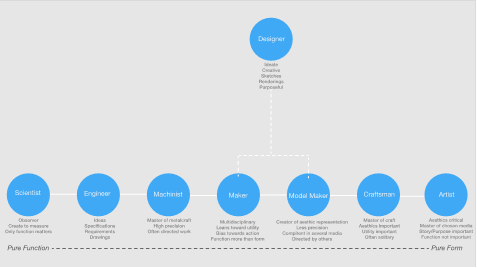 Attributes of each area are discussed and interplay between them yields a method of defining a design and applicable method of operation to maximize the designer’s effectiveness. A literature review serves to show the economic benefit, and thus motivation, to invest in industrial design activities within both emerging and mature markets. A breakdown of management and designer needs and expectations are discussed and a rationale for why a symbiotic relationship between the two disciplines needs to exist. The information gathered and analyzed from the literature review justifies the proposed designer framework/model that concludes the paper. It has been studied and shown that the involvement of designers by companies can reap significant returns on investment financially as well as from market awareness and customer satisfaction standpoints. The economic benefits serve as the backdrop for corporate motivation to heavily support industrial design efforts within the firm. In short, the financial returns on design serves as a justification for management to champion design efforts. Despite these benefits, companies have too often either limited designer’s field of influence within the organization to a very narrowly defined skill-set or have broadened their job descriptions to the point that an extreme amount of cross-discipline burden ultimately dilutes the potential impact these individuals can have. This paper attempts to analyze and define a core group of skills that maximize the ability for the designer to create, lead, align with the company’s strategies, and have an overall positive impact for the company. Anecdotally, many companies have had their success stories tied to visionary designers and an active innovation culture. Names such as Apple, Ikea, Starbucks, and Dyson are a small sampling of such well-known brands and companies. Designers often operate outside of the comfort zone of management’s premeasured, analytic forecasts. They often employ methods that appear subjective, emotional, experimental, and oscillate between abstract ideas and particular details.1,3 With such a disparity between design and management, why would management ever concede to such a risk and cost? Hertenstein, et al. went deeper with their research seeking to compare return on assets, return on sales, level of sales growth, net income, operating cash flow, and stock market returns between firms with high- and low-levels of industrial design support/activity.5,7 The seven-year aggregate of financial data analyzed showed a consistent correlation of design activity to higher financial performance. In almost all cases the confidence level of the correlation was beyond .01, with two-tail test.7 In other words, there was a greater than 99% confidence that the higher financial returns were impacted by increased industrial design efforts. Designers live between doing (designing: verb) and delivering a final product (design: noun).1 Liedtka states that “Real-life behavior, rather than theory, is what matters for design.”1 This underscores the difference, once again, between the pragmatic and number-driven universe of management and the design world, as noted in the last section. Designers bring a significant value to the product development side of the business and can elevate the company’s performance and perception. However, designers and management must co-exist in a symbiotic environment; each playing to their own strengths and relying on the other to supplement their weaknesses. Business strategy is the machine that delivers the design to the marketplace. It is also the backbone that captures profits from the consumer to ensure that the company is on solid financial footing and operations can continue unabated. Liedtka defines four major areas that a business strategy or business/product idea must meet in order to be a truly attractive venture: Value Creation, Execution, Scalability, and Defensibility.1 Designers are trained and are well versed in the Value Creation area. However, the other three are within the core-competency of business leaders and management. What follows takes the above-mentioned interplay between management and designers and combines those insights with traditional roles that designers play to create a model of designer attributes to be most effective within a convergent world. 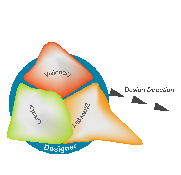 The model presented provides three aspects that define the core competencies for the modern designer. These pillars align with the above-described interactions of designers within the companies whose goals are to drive innovation through design. 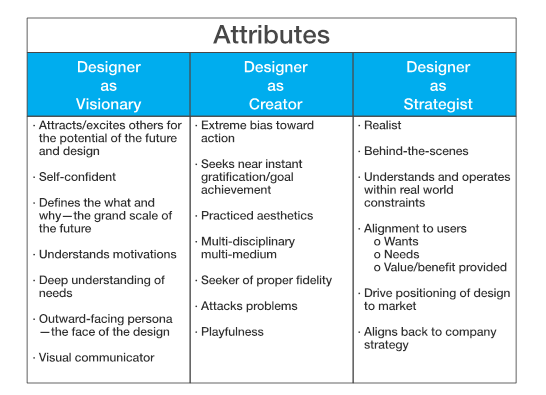 These characteristics breakdown into the following categories: Designer as Creator, Designer as Visionary, and Designer as Strategist (Figure 1). It should be noted that in this model, each of these areas creates a check-and-balance between one another. This allows each area to stretch the others in significant ways, but also to keep one another in alignment with the goals of the company and within a pragmatic worldview of what is possible. The result is affecting a design direction that is appropriate for both the firm as well as the end-user. Figure 2 highlights this interplay between the designer personas graphically. The Visionary and Strategist are the main direction drivers, where the Creator can be thought of as providing feedback and data that shades to the Visionary or Strategist side, as appropriate. The macro direction of the design can range from radical to pragmatic as dictated by the Visionary and Strategist struggle for dominance. The left image of Figure 2 shows the Visionary mindset having a much larger influence and pulling the design in a much more innovative direction. The right side of Figure 2 demonstrates the more pragmatic side of the Strategist impacting the design direction. This model works well with the Utterback and Abernathy product evolution methodology as well as the observations by Gesmer and Leendner showing that the maturation of a product/market has a direct correlation to the financial impact to the company as well as the novelty of the design—incremental designs for mature markets/innovative designs for emerging markets.5,7 In short, a newer product/industry will likely have a much higher innovation level with the Visionary persona having a much larger influence on the design. However, as a product/market matures, incremental improvements in the design and functionality of the product are the rule. As such, the pragmatic Strategist has a much higher impact on the direction of the design. A visionary is often held up as the pinnacle of what a great designer should be. The visionary is the designer that has the uncanny ability to see deeply into a scenario, understand the motivations of that consumer, and deliver a simple, yet complete, aesthetically beautiful product that ultimately transcends the ‘thing’ it was designed to be and becomes a timeless icon of an age. This is an incredible amount of pressure for the visionary to live up to. Indeed, the visionary is often focused not on today, but well into the future that by definition does not yet exist. It is up to the visionary to inspire and communicate the perspective of this future ideal. The visionary also sets the stage for the quality and refinement of the embodiment of the design. Further, it rests on the visionary to align the design with the values and mission of the company and to ensure that the overall team internalizes such values. The visionary is constantly struggling between the potentials of a perfect tomorrow with a deep understanding of needs and motivations that are the limitations of today. These observations allow the visionary to take on the role of trend forecaster. The visionary operates methodically and with intention. Otherwise, design without vision often leads to mediocrity. The visionary has a bias to always push toward the perfection that tomorrow promises, only to be held in check by the other two personas of the designer’s triad. The visionary ‘directs’ the maker and informs the strategist and is adept at being a future trend spotter. 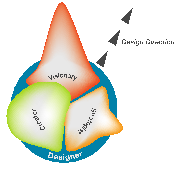 The three first characteristics usually attributed to a designer are master of aesthetic application, agile developer/experimenter, and evaluator of results to allow for feedback into the iterative development process. The extreme bias toward action and outcomes manifests itself in physical prototypes or mock-ups that can be quickly tested and evaluated. To further clarify the definition of the designer in this role, the following spectrum has been developed that ranges from pure function to pure expression/form (Figure 3). The ability to give physical form to the design is integral to gathering feedback and ascertain the kind of understanding that generates innovative outcomes desired by the company, markets, and users. The creator is both pushed by the visionary to perform and create at an extreme level as well as kept within the limits of what is needed and practical by the strategist. The strategist is the realist and holds a very pragmatic view of design execution and its alignment with company goals. However, a distinction needs to be made: the Designer as Strategist does not play the corporate management role of strategy. It should be considered that the Designer as Strategist works solidly within the design realm to align the design to the market within real-world constraints and to align the design as closely as possible to corporate strategy. The strategist keeps the creator and visionary within bounds of the constraints of the project/company goals. In particular, the strategist works to make sure that the visionary brings insight back into focus for the real world and pulls the information gathered from the creator to align the design in such a way to deliver value to the user and the company. The strategist also strives to properly scope the design to the maturation of the market as well as the expectations of the user and company. This creates the most tension with the visionary, as often the ‘right’ design is not the most ambitious or grandiose. The strategist further refines the direction by looking toward the users with both a design-focused and company-focused lens. This allows the design to properly position the design and as closely align the design sensibilities to the firm’s goals and structure to maximize the potential for success. This paper started by describing the differences between management and design and then made a case for a positive financial impact on the company by an active investment in industrial design. Next, a short deconstruction of who designers and managers are and what motivations they each then led toward a stance of why both camps need to work well together in a symbiotic relationship to maximize their impact for the firm. Finally, the foundation that was laid earlier in the paper is leveraged into a triad of designer personas: Designer as Visionary, Designer as Creator, and Designer as Strategist. These three definitions align with the needs of the firm while maximizing the effect that designers can have both on the firm as well as the users. Liedtka, Jeanne. “Business Strategy and Design: Can This Marriage Be Saved?” Design Management Review, vol. 21, no. 2, 2010, pp. 6–11. Mankins, Michael, and Richard Steele. “TURNING GREAT STRATEGY INTO GREAT PERFORMANCE.” Harvard Business Review, vol. 83, no. 7,8, 2005, pp. 64–72. Herm, Steffen, and Jana Möller. “Brand Identification by Product Design: The Impact of Evaluation Mode and Familiarity.” Psychology &Amp; Marketing, vol. 31, no. 12, 2014, pp. 1084–1095. Freng Svendsen, Mons, et al. “Marketing Strategy and Customer Involvement in Product Development.” European Journal of Marketing, vol. 45, no. 4, 2011, pp. 513–530. Gemser, Gerda, and Mark A. A. M. Leenders. “How Integrating Industrial Design in the Product Development Process Impacts on Company Performance.” Journal of Product Innovation Management, vol. 18, no. 1, 2001, pp. 28–38. Hertenstein, Julie H., et al. “The Impact of Industrial Design Effectiveness on Corporate Financial Performance *.” Journal of Product Innovation Management, vol. 22, no. 1, 2005, pp. 3–21. Utterback, and Abernathy. “A Dynamic Model of Process and Product Innovation.” Omega, vol. 3, no. 6, 1975, pp. 639–656. Venkatesh, Alladi, et al. “Design Orientation: a Grounded Theory Analysis of Design Thinking and Action.” Marketing Theory, vol. 12, no. 3, 2012, pp. 289–309. Thilmany, Jean. “The Maker Movement and the U.S. Economy.” Mechanical Engineering-CIME, vol. 136, no. 12, 2014, pp. 28–29.